Since the kids are back in school and the house is finally quiet, you might have a little bit of extra time on your hands. Why not spend some of it exploring something you’ve always been interested in but never had a chance to try? Dragon Fire Ceramics is offering a couple of pottery classes this fall that are perfect for anyone out there who is looking to get their hands dirty and explore their inner ceramic artist. Our Beginning Pottery/Wheel Throwing on the Electric Wheel class is perfect for students who haven’t worked with pottery before, but have always been interested. This class will use our state-of-the-art Shimpo VL Whisper electric pottery wheels to teach students the basics of throwing mugs, bowls, vases and pitchers. The class instructor, Kitty Sabelman, an experienced potter, has been working with the wheel for over a decade. This class is perfect for beginners, and will give you a chance to pick up some of Kitty’s techniques that you can use to expand your skills. You’ll even be able to take home some usable handmade glazed and fired pottery. Just think – you can show your kids what you made in class for a change! Our Adult Pottery class is great for students who have a little bit of experience with the wheel, but we’ll work with newbies in this class, too. This class focuses on mugs, bowls, vases, lidded canisters and platters, all made using our electric wheel. This is also a great opportunity for you to socialize with some of the other people in your circle. Sign up as a group with some of your friends and see how much fun you can all have working with clay together! Dragon Fire Ceramics is dedicated to bringing the art of working with clay to residents in Wrenshall and the greater Minnesota region. We love meeting new locals, inspiring people and teaching new students that even though you think you may not be artistically inclined, you can make something totally unique and interesting if you put your mind to it. These classes are perfect for parents looking for a bit of “me-time” during those quiet mornings when the kids are off at school, so sign up today and let your artistic side run free this fall. To learn more about signing up for one of our classes, call us today at 218-384-9374. 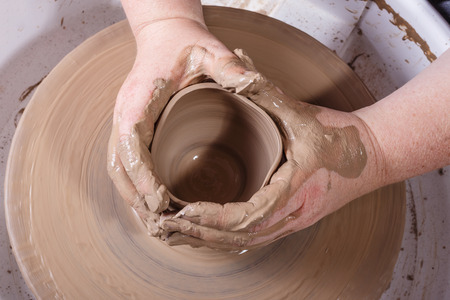 ← Why Is Pottery So Lasting?